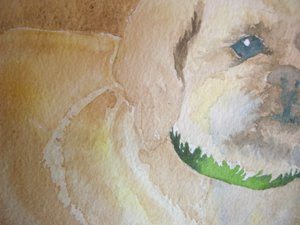 Using Quinicridone Gold and Burnt Sienna, both separately and together, work around the light areas of the dogs and develop patches of light and dark where appropriate. 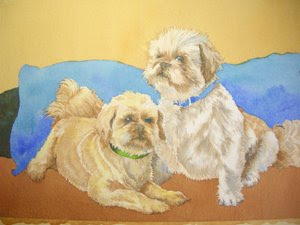 Use other variations of the colors we used in the previous washes to develop deeper values, small brush strokes for fur where appropriate, and to be sure that areas make sense to the viewer. Be sure to step back often at this stage to view the painting as a whole.